Fallout dismantles the conventional story of why the atom bomb was built. 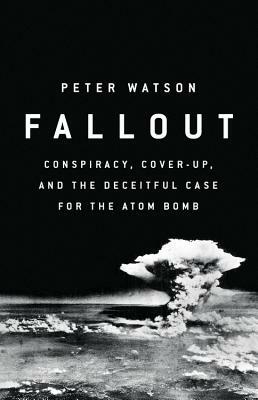 Peter Watson has found new documents showing that long before the Allied bomb was operational, it was clear that Germany had no atomic weapons of its own and was not likely to. The British knew this, but didn't share their knowledge with the Americans, who in turn deceived the British about the extent to which the Soviets had penetrated their plans to build and deploy the bomb. The dark secret was that the bomb was dropped not to decisively end the war in the Pacific but to warn off Stalin's Russia, still in principle a military ally of the US and Britain. It did not bring a hot war to an abrupt end; instead it set up the terms for a Cold one to begin. Peter Watson is a journalist, television presenter and historian of intellectual movements. He has written for the Observer, the Daily Telegraph, The Times, The Sunday Times, the New York Times and the Spectator. His books include The Modern Mind; Ideas: A History from Fire to Freud; and The German Genius; The Age of Atheists; and Convergence -- and he has been published in 26 countries.